We are a large coalition of Neighborhood Councils and welcome everyone to this open process. Don’t be left out! Join the LA NC Coalition! Send a delegate from your Neighborhood Council to represent you in this important process in Los Angeles. Neighborhood Councils in Los Angeles came about with the revision of the City Charter in 1999. Article IX, Section 901(c) of that Charter states that the Neighborhood Councils should come together as a Congress of Neighborhoods. Why a “Congress of Neighborhoods”? What did the members of the Revision Commission mean when they used that term? 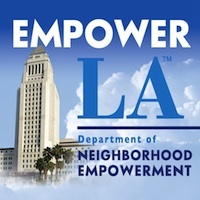 According to the members of the Revision Commission, it was envisioned that Neighborhood Councils would come together to communicate with one another and to discuss and decide major issues affecting the citizens of Los Angeles. The formation of the Congress was to be left up to the Neighborhood Councils themselves.